Manage your district with simplified online management. Easily manage multiple locations, and the hundreds—or even thousands—of added phone lines, new room assignments, and the many other updates your district’s phone system requires every year. 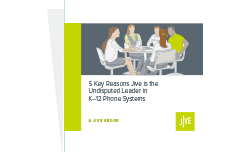 More K–12 customers trust Jive with their voice communications than any other hosted provider on the market today. 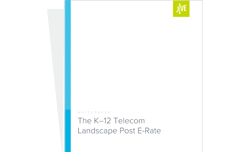 Jive specializes in delivering simple, cost-effective communications solutions customized for schools like yours. Whether it’s a single school deployment with a few dozen handsets or a multi-site school district with thousands of phones, Jive has the right phone solution for you. 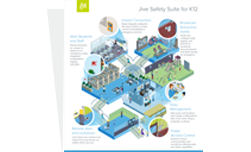 Jive Safety Suite leverages and expands your existing systems to launch a coordinated emergency response. Instill confidence in students, staff, and the community with a safety solution tailored to fit school budgets. Maintain school communications even during an outage. Jive ensures your school communications continue even during a WAN outage. Emergency dial-plans automatically re-route call traffic off-net for uninterrupted local calling and prioritized emergency dialing.